Spotify (NYSE: SPOT) has filed an antitrust complaint against Apple (NASDAQ: AAPL) with the European Union. The resolution of the complaint should be positive for Spotify stock. Heading into the launch of its new streaming service, Apple is facing another backlash from its old competitor in the streaming-music space, Spotify. Meanwhile, if the EU puts regulatory roadblocks in Apple’s way, investors’ sentiment towards Spotify stock should improve. SPOT has claimed that Apple has been regularly making rule changes which prevent SPOT from showing promotions or new features in its iOS app. In related news, Netflix (NASDAQ: NFLX) recently stopped paying Apple’s “tax” on subscriptions. NFLX may also launch an antitrust complaint against Apple as the latter tech giant aggressively promotes its new subscription services. Given these actions by Apple’s competitors,AAPL may not have smooth sailing as it tries to increase its footprint in Services. SPOT has complained about the 30% “tax” levied by Apple’s App Store for a long time. However, in Spotify’s recent complaint with the EU, SPOT mentioned a number of other restrictions on its app which can also bolster its case, paving the way for a victory and a positive catalyst for Spotify stock. Specifically, Apple does not allow Spotify to promote any new discounts on the iOS app. Additionally, the definition of promotions has been changed in the past few quarters, negatively impacting Spotify’s subscriber growth and Spotify stock. Last year, Apple prohibited use of the phrase “Get in, Get Premium” by SPOT. AAPL has restricted many other innocuous promotions by SPOT. Some of the restrictions on the app are limiting its functionality, which is a big negative for Spotify’s customers. That, in turn, may displease the EU’s regulators. It is quite certain that Netflix will also start building its own antitrust case against Apple’s video-streaming service in the near future. At the heart of this issue is the question of how to monetize apps. Apple’s 30% tax is quite high, given the current environment in which smartphones have become commoditized. At the same time, Apple needs to monetize these apps to justify the investments it’s made in upgrading iOS. Additionally, smartphone unit sales are declining in all the major regions in the world. 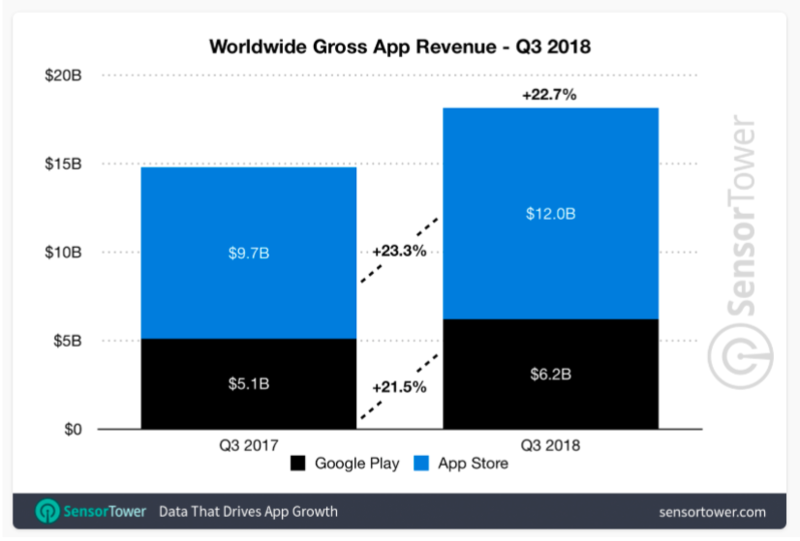 Although the App Store’s revenue growth is still quite healthy, falling iPhone sales could lower the growth of App Store revenue to single-digit percentage levels. That, in turn, would put more pressure on app developers. Although bigger app publishers like Spotify and Netflix have been able to avoid paying the Apple tax, other, smaller app developers might not be able to do so. Regulators may impose restrictions on Apple to protect the interests of small app developers as well as bigger players like Spotify. The EU has been quite active when it comes to fining tech giants in the past few years. In 2017, Google (NASDAQ: GOOG) was fined 2.4 billion euros for its shopping business while in 2018 it was fined 4.3 billion euros for stifling competition on Android. Spotify is one of the few European tech companies which have been able to spread around the wold. The EU will probably try to defend SPOT if it feels that Apple has sought to meaningfully stunt its growth . SPOT’s home team advantage, in this case, bodes well for Spotify stock. AAPL also faces a Supreme Court case in the U.S,which will enable the justices to decide if iPhone users can bring an antitrust suit against the company. During the last oral arguments in November 2018, the Supreme Court appeared skeptical about Apple’s arguments.. Moreover, recently Senator Elizabeth Warren said that Apple should not run the App Store and also sell its own apps on the platform. Even minor setbacks from the EU, the Supreme Court or other regulators could meaningfully damage the sentiment towards Apple stock. The App Store is a big part of the Services segment. Going forward, higher revenue from the Store’s subscription “tax” is expected to meaningfully boost Apple’s top line. Most of the bullish analysts point to the Services segment, of which the Store is an integral part, as the future growth driver of Apple stock. If the Store’s revenue suffers a big setback, sentiment towards Apple stock will become bearish over the long-term. SPOT may end up making new partnership deals to counter Apple’s streaming service. It already has a strong partnership with Hulu. It is possible that Spotify and Netflix will team up in the near future. Such a partnership would be very attractive for both companies’ subscribers and provide a big boost to Spotify stock. It would be difficult for Apple to fight off the combined platform of Spotify and Netflix, since Apple lacks original content. To boost its Services revenue and Apple stock, AAPL needs to make a big play in the subscription segment. Only by promoting its own streaming services can it accomplish that. Regulators will have issues with Apple if it is preventing competitors from upgrading their apps or providing better services to their customers. It is too early to say if the EU will levy a big fine on Apple. However, Spotify’s antitrust complaint against Apple should at least result in some of the restrictions placed on Spotify’s app by AAPL being eased. Spotify stock has been holding strong, despite the pending launch of Apple’s streaming services. Sentiment towartds Spotify stock should improve if the reception to Apple’s new platform is lukewarm. As of this writing, Rohit Chhatwal did not hold a position in any of the aforementioned securities. The post How Spotify Is Poised to Boost Spotify Stock and Hurt Apple appeared first on InvestorPlace.